In the many cycle races I've done, my commonest result by far is last, even when I'm not actually last, but just right near the back, the results seem to appear with me last. I tell myself I don't mind, there really is no difference between 11th and last in most of the races I do, and since becoming a 3rd cat, points mean little, so I just want prizes, and there's generally only money for the top 5. Actually what I really want is to be pleased with the race, the results really comes second. Of course if I went a season never getting a result, I'd not be happy. But I'm geeky enough that good numbers, no crashes, and a sense that I didn't do anything stupid makes for a happy race. Saturdays race was the Hillingdon winter series 3rd cat only race, and us Kingston Wheelers were out in force. After a very fast start led out when the entire bikefood team decided to take us out for the first 5 laps averaging 42.5km/h against the more normal 40km/h for Hillingdon. Everyone was pretty fresh though, and only a couple of people got caught out enough to be dropped, everyone else just enjoyed the speed. I did more than work than necessary, going back and forth through the group to see how Maryka and the other clubmates were doing and just generally drifting back through inattention and then deciding to move up again. After the bikefood guys had tired themselves out, the average pace slowed to the more normal 40km/h, but it was the normal up and down of attack / chase / lull. We had many people regularly off the front, but the pack was always very alert, even with some blocking work nothing looked likely to escape. Inevitably when the 3 lap to go board came out, everyone slowed down and we had the slowest lap of the race, and it didn't speed up much more during the next two. 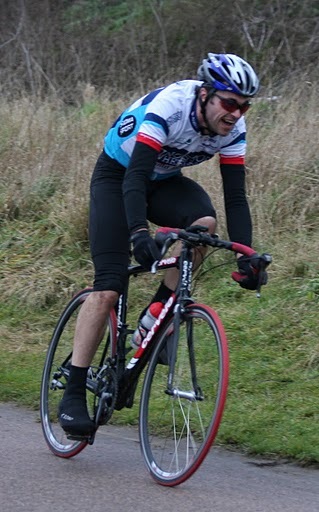 My normal poor position, and the slowness left me struggling to move up on the packed circuit. Coming up to the bell I was midpack and desperate to move up, remembering James's request for a fast last lap, and if I was anywhere but the front I wouldn't be able to help with that. Just before the chicanes the pack slowed so much I was at my slowest speed all race, but as soon as the chicane apexed I was on the outside and had a clean run to the front, I accellerated hard but instead of finding myself at the front of the bunch, I found myself 10m off the front so I kept going hard through the S bend and was now solo away from a baying bunch. 30seconds into it I thought YES! I've 50m already I'm going to win here. A minute into it, hurting like crazy I thought NO! why did I start this stupid idea! 90 seconds into it I looked again behind me, and I still had 60 or 70m on the bunch YES! two more corners and just the matter of a 250m hill. At the last corner I look again, and still they're not close. 50m up the hill, I stand to eke out the last power I have, and find out it's none, I collapse, the hill chases any speed I have out of me and shortly after 44 riders sweep past and I inch over the line to last place. So last place, but the stats tell an interesting story. Almost all the time I made up on the bunch was through the S bend, which I did in 42 seconds, rather than a typical 58seconds for the pack. Through the back straight and the two subsequent corners the bunch only gained back a few seconds on me, it was only once I could no longer deliver the power that I was caught. The 42 seconds cost me 580 watts though, so getting away was tough, and left me only managing to deliver 380watts for the remaining 80 seconds of my ill fated solo effort. In the middle of a club run on sunday, I did 380 watts for almost 7 minutes up Box Hill, so in looking at the raw stats, I should've been able to keep it going for the win comfortably, but the previous hour of hard riding had simply taken too much out of me. So now I'm stuck wondering, if I did the same, but without having wasted so much energy in the race, would I have stayed away? The picture below, taken at the final corner, not long before I blew up, shows another reason I failed. I'm simply too un-aerodynamic to be doing anything solo, I waste so much energy fighting the air. It's a reason to get a new bike, one suited to racing, and not cycling around the hills in great comfort, the RS is awesome, but I shouldn't be racing crits on it. The good turnout by many strong Wheelers has really got me looking forward to the road racing season, when I won't be there mostly for training, wasting energy, and with more strong wheelers like Damien still to race it should be a fun year! This entry was posted on Mon Jan 25 23:31:54 UTC 2010	and is filed under fitness, cycling. Tue Jan 26 08:13:06 UTC 2010 Your time will come! Not sure you need a new bike, just bend the elbows more!